OPI's Nice Stems! collection is a set of four floral pink polishes- a glass fleck, a neon shimmer, a pastel pearl and an awesome chunky glitter. OPI Be A Dahlia, Won't You? Such a shiny color... My picture doesn't do it justice. It's a bright fuchsia jelly polish base with pearly blue, pink and violet glass fleck shimmer. It's so reflective and luminous, just like a good glass fleck should be. The color is fresh and bright and very cheerful. OPI Come To Poppy. Very unusual shade! I wasn't expecting to like this based on bottle color, but it looks way better on the nails. On the nails, it's a hot pink shimmer. It's so bright that it really seems neon. It even dries semi-matte, so there must be at least some neon pigment in it. It's a bit of a warm, coral-tinged hot pink with silvery-pink contrasting shimmer. Nice and bright and alive looking. OPI I Lily Love You. This is a sheer pink base with a variety of different glitter shapes suspended in it. There's some really big chunks of opalescent mylar flakes, there's tiny opal glitter, squares, circles, tiny hex. Worn alone it looks like a girly birthday party on your nails. It's even better layered. OPI Play The Peonies. This is a very pale oyster pink. It's slightly greyed and very soft with really only a hint of warm baby pink to it. It has a pearl finish which makes it look smooth and glossy. I had trouble with this one streaking, but three coats evened it out. I think I'm drawn to this one because of the name... My grandma used to grow these huge, fragrant peonies in her yard and most of them were this color (white tinged with pink), so it makes me a little sentimental. OPI I Lily Love You (one coat) over Be A Dahlia, Won't You? These look like they were made to be layered together. The base colors of the two polishes compliment each other perfectly and the chunky glitter amplifies the duochrome quality of the glass fleck particles in Be A Dahlia. OPI I Lily Love You (one coat) over Come To Poppy. HOTNESS. OPI I Lily Love You (one coat) over Play The Peonies. So pretty and delicate. The sheer base of I Lily Love You adds a sheen of baby pink color to the nearly-white Play The Peonies and the glitter looks twinkly and ethereal. OPI I Lily Love You over Julep Anne. Anne is an amazing color on its own (very similar to one of my favorites, Illamasqua Jo'Mina) but it's even better with a coat of chunky opal glitter. 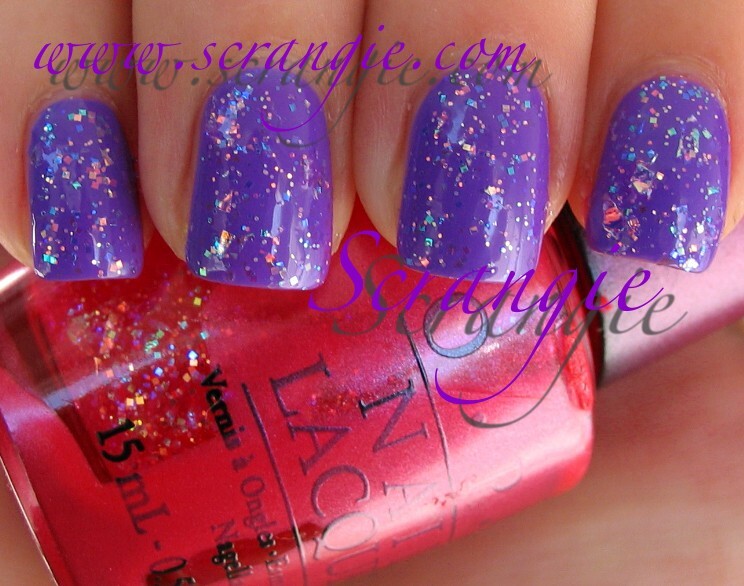 OPI I Lily Love You (one coat) over a-england Lancelot. 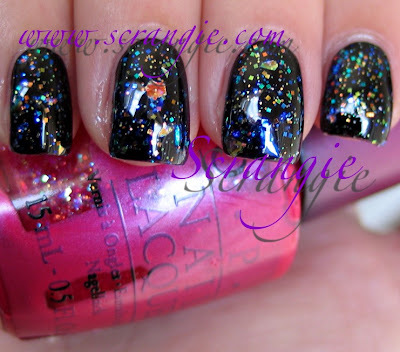 Lancelot is a beautiful polish (review forthcoming) and it's even nicer with glitter. The dark, near-black base really brings out all the colors and shapes of the glitter. It creates a nice contrast- go ahead and enlarge the pictures so you can see all the different shapes. The formula on these was good, for the most part. Be A Dahlia and Come To Poppy were flawless and only needed two coats, but I did three of everything anyway. Play The Peonies was a little thin and streaky. I Lily Love You is thick and a little rough due to the big mylar glitter shards. Drying time was perfect on all shades. It's really rare for me to like pinks, let alone be excited about them- but these are GREAT. 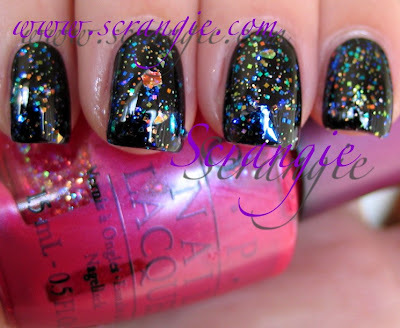 Glass fleck, neon, glitter... They're all gorgeous. I even like the pale soft pink one. 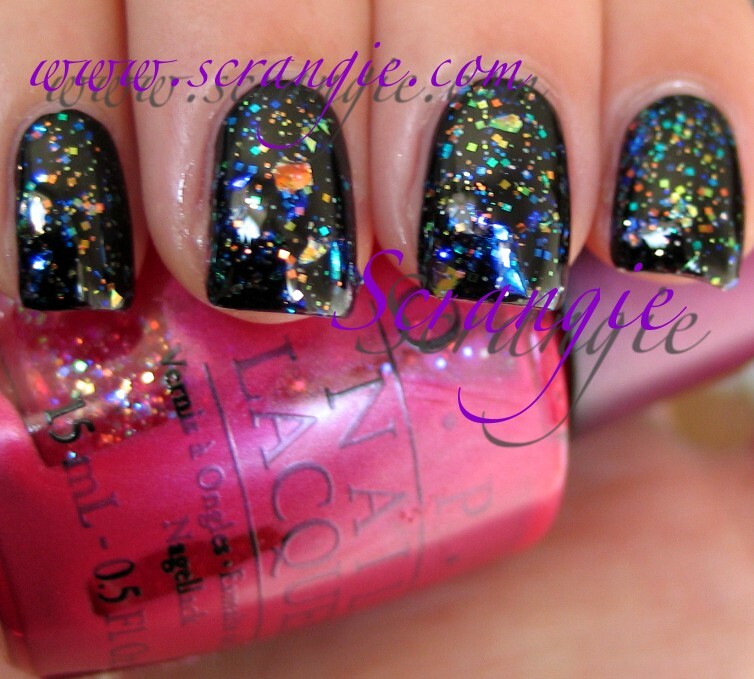 The glitter is my favorite part- it looks like pictures I've seen of this rare overseas exclusive OPI glitter... I can't remember if it was UK or Japan exclusive, but it was gorgeous and this looks just like it (well, just like the pictures I've seen of it, at least). So yeah, it's all pink, but they're all good ones. Bright, flashy, glittery. I would wear each and every pink in this collection. I thought I would be disappointed with these, but I'm so not. Love them all. NeutraKris, that's good because it only costs $8.50 at full retail! I got I Lily Love You, but haven't tried it out yet. I like how it looks in your layered looks. The last one got awesome! I love how I Lily Love You looks over black! I wasn't sure if I was going to get it but your pics sold me on it! Gorgeous! 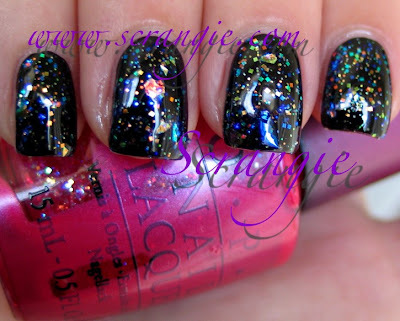 I love the glitter, and I didn't expect to. Thanks for the beautiful pictures. How does Come to Poppy compare to Pompeii Purple? They look rather similar to me. I love I Lily Love You over the black polish. This is definitely going on my wish list. Thanks for sharing. I am in major love with this entire collection. It had me with Dahlia and it's flake plus it being a great fuchsia which some of you know I have a huge penchant for. Like you, did not think I would like Peonies and now really like it. Different than anything I have and looks good with Lilly layered as well as others layered over it. Poppy has taken me more time to warm up to because of the finish going toward matte which I am not a fan of. But again with clear as well as other layering, I have really had fun with it. I personally am stashing extra bottles of some of these because for me, they will be standards I will want to pull out, esp for my toes in spring,summer, early fall where I live that is still summer. Nice to see Lilly over some other shades. It has sooooo much to it - very complex and putting it over the dark one really is a good show of what Lilly has in it. I am hoping they make a couple of this collection into the classics. Dahlia is a strong candidate due to the flaky in it. I think I need these! Pretty pinks.